Mark McInroy is an assistant professor of systematic theology at the University of St. Thomas, and is the book review editor for ARTS. He has published academic examinations of Origen of Alexandria, Martin Luther, Karl Barth, Karl Rahner, and Hans Urs von Balthasar. He is the author of Balthasar on the Spiritual Senses: Perceiving Splendour(Oxford University Press, 2014). Fr. 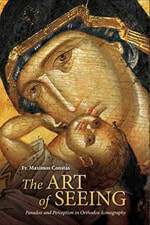 Maximos Constas, The Art of Seeing: Paradox and Perception in Orthodox Iconography (Alhambra: Sebastian Press, 2014). In The Art of Seeing: Paradox and Perception in Orthodox Iconography, Fr. Maximos Constas draws from patristic authors and other figures in order to provide resources for the theological interpretation of icons. Although scholars are typically more skilled in their interpretation of texts than of images, Fr. Maximos holds that his approach stands to enrich contemporary reflection on icons, and his erudite, interdisciplinary forays deliver what they promise. and impress [themselves] upon the mind,” and that as a result “the image becomes a locus of contemplation, a privileged place for layered networks of meaning” (54-55). In a treatment of the contrasts between the right and left sides of the face of Christ in the Sinai icon, Fr. Maximos holds that we see in this image a polarity between divine justice and mercy. The theological lesson is as follows: “Beholding the face of Christ, the viewer sees, as if in a mirror, his own inner division, a vision of himself outside himself, in conflict with himself. He sees the image of God within him reflected in God’s Eternal Image, and judges his own likeness poor and disfigured” (86). However, emphasizing God’s mercy, Fr. Maximos continues, “At the same time, our icon embodies a message of profound hope, for Christ came not to destroy the world but to save it. And thus we are drawn, not to the eye of the dread judge, but to the side of mercy, the eye of the loving God” (86). Chapter 2, “‘Veil of Flesh, Well of Living Water’: The Paradoxes of the Annunciation,” focuses on icons of the Annunciation, and Fr. Maximos argues that subtle elements such as a thread or pitcher of water open up easily overlooked theological meaning. Concerning the thread motif, he explains, “The purple thread wends its way through a labyrinth of associations including the veil of the temple, the biological production of human tissue, the limit of mortal life, and the suffering and death of Christ on the cross” (134). Chapter 3, “‘Put on the Armor of God’: Saint George in Byzantine Texts and Images,” examines the icons of Byzantine warrior saints, especially George, Demetrios, and Prokopios. Fr. Maximos holds that this iconography “presents the viewer with a striking contrast between two uneven aesthetic surfaces … calling forth a series of cognitive responses that this chapter argues correspond to the stages of a spiritual exercise” (159). The final chapter, “Revelation as Concealment: Towards a Theology of the Icon Screen,” draws from the theology of St. Symeon of Thessaloniki in order to reconstruct the ways in which the icon screen was viewed as a liminal space on the borders of both sensible and intelligible realms. Illustrated with 73 color images, the volume is an uncommonly sophisticated interdisciplinary venture that rewards the art historian, theologian, and those in between. 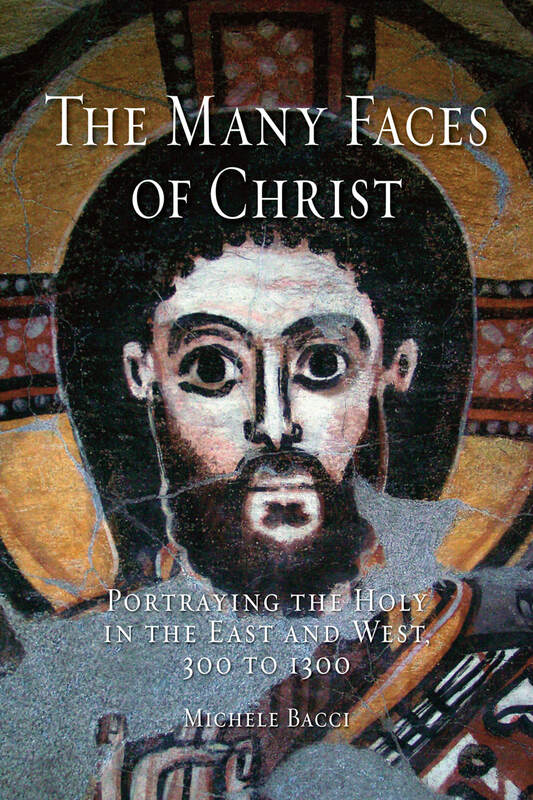 Michele Bacci, The Many Faces of Christ: Portraying the Holy in the East and West, 300 to 1300 (London: Reaktion, 2014). ​special attention. The following section, “Mythic and Material Images,” treats of the iconodules’ response to Byzantine iconoclasm, noting the importance of the history of the Edessan Mandylion, “for it implied that Christ himself had wanted his image to be transmitted to future generations” (48). The next section, “Material Indicators of Holy Persons’ Earthly Presence,” observes that both Christian and Buddhist traditions employ memory in such a way that adherents often sense the physical presence of the holy persons who are being recalled. “The Exercise of Sight and the Art of Body Inspection” argues that sight plays a central role for devotion in Eastern and Western religious traditions. Here Bacci argues that “the physiognomic inspection of holy men aimed not only at detecting a person’s hidden inclinations and high moral qualities (which could be taken for granted by the faithful), but also at revealing their already enacted transformation into sublimated, celestial bodies” (76). The final section of Part I, “Figurative and Written Records of the Holy Men’s Physical Characteristics,” claims that this desire for physiognomic inspection, when its object was an absent holy person, drove a conception of portraiture as providing records of the actual features of those depicted. The second part of the volume begins with a section titled “Christ’s Controversial Visibility,” which treats of the early patristic tradition of regarding Christ as not having a single, fixed physical appearance. According to this way of thinking, found in Origen of Alexandria and others, Christ appears differently to observers based on their subjective (often moral) state. One aspect of this fluidity is discussed in the next section, “Handsome or Ugly?” Bacci notes that the question of Christ’s physical beauty, or lack thereof, exercised the early church. Associations with Isaiah’s Suffering Servant suggested that Christ had “no form,” and was ugly, yet Christ’s supernatural beauty was emphasized as well. Another tension is taken up in the next section, “Conflicting Hairstyles,” which similarly notes the lack of a single, fixed style of hair and beard in Byzantine images of Christ. In the case of these particular physical features, Bacci observes regional differences such that a short-haired Christ often appears in Syro-Palestinian areas, and the long-haired alternative frequently in Greek-speaking portions of the Mediterranean basin. Although the short-haired Christ is less familiar to contemporary audiences, Bacci holds that it was sufficiently authoritative for Justinian II to place it on his currency in the eighth century. In “Christ’s ‘Identikit,’” Bacci argues that perceptions of Christ’s appearance stabilize during Byzantine iconoclasm. The next section, “The Colour of Christ’s Skin,” notes that, although recording ethnicity was not the primary focus of iconographers, one does find reference to Jesus having skin the color of corn (sitochroos) in the sixth-century Narratio de rebus Persicis. This became a norm of sorts, with the intriguing exception of Pseudo-Hippolytus of Thebes, “who substituted sitochroos with the similar-sounding melanchrous, which hinted clearly at a black complexion” (162). Ultimately, however, Bacci holds that the authors of such descriptions were not attempting to associate Christ with a particular geographic region or race; instead, they were animated by theological and literary factors connected to biblical interpretation. “Disputations on Curly and Woolly Hair” explores similar issues, and here, too, Bacci argues that descriptions of Christ’s hair were not intended to link him to particular geographic origins. In “Hair and Priestly Fashion,” Bacci insists that hairstyle, far from an ethnic marker, instead communicated one’s status and profession. In the final section, “Christ’s Long Hair and St. Paul’s Baldness,” Bacci treats of a seldom-discussed feature of the Christian tradition: namely, that Christ comes to be depicted with long, flowing hair despite the prohibitions against such self-presentation by the apostle Paul. Bacci’s intriguing examination of a surprisingly neglected theme will be of interest to scholars from a wide range of professional backgrounds. The book is lavishly illustrated with 118 images. 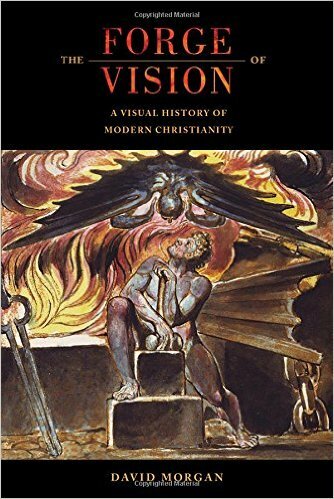 David Morgan, The Forge of Vision: A Visual History of Modern Christianity (Oakland: University of California Press, 2015). words, the imagined community of Christian ​​nationhood, the imagined likeness of Jesus, and the legacy of Christian visuality in the history of modern art” (8). Chapter 1, “The Shape of the Holy,” first treats of the authority that images enjoy in the Catholic tradition, using Jan Gossaert’s Saint Luke Drawing the Madonna and Child (1520-1525) as emblematic of the importance of the visual dimension of Catholic piety. Morgan contrasts this sensibility with that of the Swiss Protestant Ulrich Zwingli, for whom the image is unable to teach anything about the Christian faith. This Protestant aniconic impulse is well documented, but Chapter 2, “The Visible Word,” makes an unexpected and important claim: namely, that, in spite of the Protestant emphasis on “the word,” the reformers do actually make significant use of images, although those images differ in telling ways from their Catholic counterparts. Morgan focuses on Lukas Cranach the Elder’s 1547 painting of Luther preaching, which formed the predella of the Wittenberg altarpiece. The viewer sees a “sonic emblem,” as Morgan puts it, of the topic of Luther’s sermon: namely, Christ, who hangs on a cross between Luther and his congregation. To Morgan, the fact that this painting was used as part of an altarpiece constitutes “a fundamental rejection of the claim . . . that images could teach nothing about religious truth” (50). Part II begins with Chapter 3, “Religion as a Sacred Economy,” and it is here that Morgan analyzes the important role played by images in cycles of exchange. After a brief rehearsal of the history of indulgences, Morgan notes that images functioned as a site for receiving various benefits as mediated through the Catholic Church. For instance, saying the Lord’s Prayer in front of an image of the Mass of Saint Gregory could result in up to 430 years being taken off one’s time in purgatory (76). To the Catholic mind, the honor paid to the image passed on to God. Morgan argues that reformers such as Calvin inverted images into a “negative icon,” as paying honor to an image actually robbed God of the honor due to him. Chapter 4, “The Agency of Words,” explores various Protestant attitudes toward the word, including those of Calvin for whom words are preferable to images because “reason trumps imagination” (113). In Chapter 5, “Christianity and Nationhood,” Morgan argues that imagination enjoys an unexpected revival in Evangelical Protestantism that one would not expect, given Calvin’s concerns above. Morgan sees a reflection of this shift to imagination in the illustrations in Bunyan’s The Pilgrim’s Progress (1678), which explicitly encourage the use of imagination in one’s piety. Morgan then explores the role images and imagination play in constructing a conception of the nation as a religious dispensation that binds its citizens together for a shared purpose. Toward the end of the chapter, Morgan indicates the considerable divergences between Protestant and Catholic attitudes toward the modern nation-state. Chapter 6, “The Likeness of Jesus,” asks how it is that Jesus is instantly recognizable in images of him produced in the modern period. The final chapter, “Modern Art and Christianity,” begins with the claim that, despite appearances, modern art does indeed draw from the Christian tradition. Morgan then argues against the prevalent disenchantment narrative that characterizes modernity to claim that the modern period witnesses instead a resacralization of art, which becomes a medium through which the sacred is engendered in those who observe it. This cultivation of a subjective disposition Morgan sees as “rooted in the imagination, the forge of vision, that modern Christians have practiced for centuries” (199). In its historical span and variety of topics, Morgan’s study is a wide-ranging treatment of the many roles played by the image in modern Christianity. The volume contains 58 black-and-white illustrations and 12 color plates. Bissera V. Pentcheva, The Sensual Icon: Space, Ritual, and the Senses in Byzantium(University Park: Penn State University Press, 2013). Although icons have garnered increased scholarly interest in recent years, those treatments have largely focused on the painted icon; metal icons remain neglected in much modern scholarship. Pentcheva notes that even Hans Belting’s classic Likeness and Presence, which is otherwise quite thorough, does not treat of the luxury relief icons she examines. Chapter 1, “Imprinted Images: Eulogiai, Magic, and Incense,” investigates the wide array of devotional objects that arose within cults of stylite saints beginning especially in the sixth century. Here Pentcheva examines the claim made by previous scholars that the rise of icon use is intimately connected with the ritual practices surrounding stylites. Chapter 2, “Icons of Sound: Hagia Sophia and the Byzantine Choros,” supplements the scholarship of Nicoletta Isar, who maintains that the notion of chora (or choros) is crucial for understanding Hagia Sophia as a sacred space in which God becomes present through circular procession. To this notion of chora, Pentcheva seeks to add the idea of a space permeated with sound and incense, heightening the synaesthetic dimensions noted at the outset of her study. Chapter 3, “Eikon and Identity: The Rise of the Relief Icon in Iconophile Thought,” traces the history of Byzantine iconoclasm in the eighth and ninth centuries. Here Pentcheva adds to a standard rehearsal of the subject the notion that the very meaning of the term eikon undergoes significant change during this period. In response to the first wave of Byzantine iconoclasm, John of Damascus associated eikon with graphe, which was understood as painting. However, when the Damascene model later became the object of criticism, Theodore the Studite successfully responded to the second wave of Byzantine iconoclasm by associating eikon with typos (imprint). Thus, by the end of the ninth century, a subtly distinct notion of eikon had emerged, one more amenable to the central focus of her study: relief icons. Chapter 4, “The Imprint of Life: Enamel in Byzantium,” examines the ways in which relief icons from the tenth to twelfth centuries both implement and challenge the Studite paradigm. In addition to arguing for icons as typoi, Theodore also claimed that icons do not actually share in the divine nature (a “non-essentialist” view). To Pentcheva, enamel icons continue the Studite notion of imprint through their three-dimensionality, but they challenge the non-essentialist view because of the extraordinary expressive capacities of the medium. The vivid, enthralling iridescence of enamel animated these icons, thus challenging the claim that the divine presence could not be found in them. Chapter 5, “Transformative Vision: Allegory, Poikilia, and Pathema,” traces in considerable detail the effects of shifting light on the icon of the archangel Michael, the cover image of the book. Chapter 6, “The Icon’s Circular Poetics: The Charis of Choros,” notes the importance for Byzantine architecture and icons of a “circular aesthetic,” in which the circle and sphere express completion and perfection. The volume’s final chapter, “Inspirited Icon, Animated Statues, and Komnenian Iconoclasm” argues that the mid eleventh century witnessed an amplification of the essentialist view of icons ushered in by relief icons in the tenth century, as attested by reports of miracle-working icons from this time period. However, under Komnenian iconoclasm in the late eleventh century, a nonessentialist view was forced upon Byzantium, and the term eikon was disassociated from typos, and reattached to graphe. Thus ended the golden age of Byzantine relief icons, according to Pentcheva’s study. The large number of specialized terms make for a challenging read to the uninitiated, and some may be inclined to challenge Pentcheva’s claim that relief icons replaced painted icons in the ninth century; one could argue that both versions of icons coexist in the period she investigates. Nevertheless, Pentcheva has given her readers an uncommonly rich account, both linguistically and visually, of Byzantine icons, and readers will be edified by her presentation. The volume is filled with 82 sumptuous color plates.